19th century album of cabinet photographs, cartes de visite and tintypes from the Rouse and Bentley families of Nebraska, Wisconsin, Illinois, New York and other states. 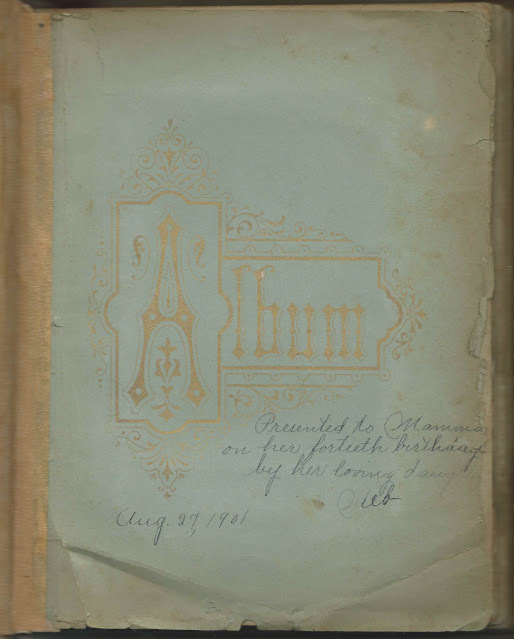 The album was given by daughter Martha Esther (Bentley) Ricketts, "Meb", to her mother Evvie Eliza (Rouse) Bentley in 1901. Whether Meb acquired the album after its creation or if she purchased an empty album and placed family photographs into the slots, I don't know. The 1884 cabinet photograph, below, shows Meb and her parents, Alton Edward Bentley and Evvie Eliza (Rouse) Bentley. The photograph was taken at the New York Gallery of 25 Third Street, San Francisco, California, by D. Sewell & Company. If you have corrections and/or additions to any of the information presented here, please leave a comment or contact me directly. CDV of an unidentified woman; no studio imprint. Eliza Rouse Barnum; presumably her maiden name was Rouse. Perhaps the wife of Proteus Barnum, whose cabinet photograph faces hers. No studio imprint, but his cabinet photograph, which faces hers, was taken at the Beals studio of Elgin, Illinois. Proat Barnum; by the Beals studio of 23 Douglas Avenue, Elgin, Illinois. Perhaps Proteus Barnum, born April 30, 1823 at Shoreham, Vermont; died April 8, 1888 at Chicago, Illinois; married an Eliza Jane, who was born in Canada about 1831. Alton Edward Bentley and wife Evvie Eliza (Rouse) Bentley, with daughter Meb, Martha Esther Bentley; 1884 cabinet photograph by the New York Gallery, 25 Third Street, San Francisco, California, D. Sewell & Co.
Alton Edward Bentley, with wife Evvie Eliza (Rouse) Bentley and three children: Martha Esther Bentley, "Meb", who would marry Joseph S. Ricketts; George Bentley; and ? At top of reverse: Meb Bentley, Meadow Grove, Nebraska. Esther A. (Young) Bentley, with husband George M. Bentley, identified in more contemporary handwriting; taken by the Conkey & Hibbard studio of Glens Falls, New York. The reverse has additional handwriting, presumably from the era when the photograph was taken: "Bentley, Meadow Grove, Nebraska". 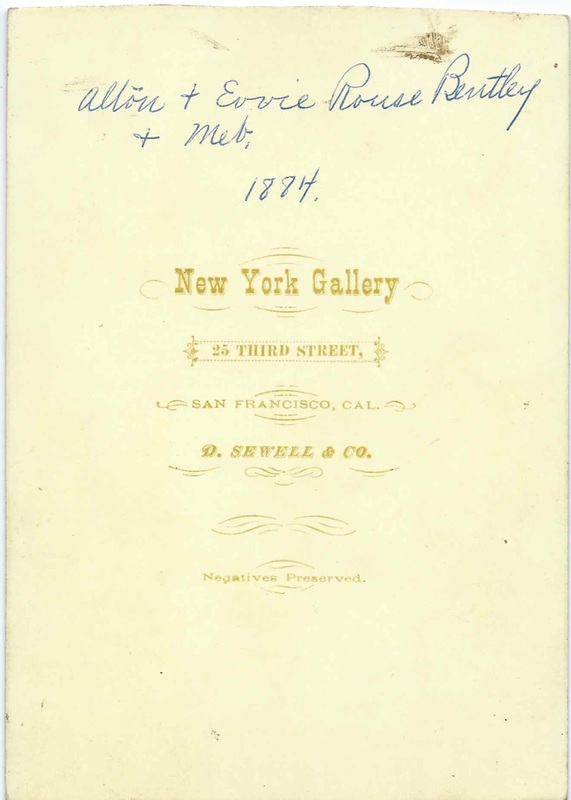 This may have indicated that the photograph was to be sent to George's and Esther's relatives there or that George and Esther were visiting at Glens Falls from Nebraska when the photograph was made. Evvie Eliza (Rouse) Bentley, with husband Alton Edward Bentley and daughter Meb, Martha Esther Bentley; 1884 cabinet photograph by the New York Gallery, 25 Third Street, San Francisco, California, D. Sewell & Co.
George M. Bentley, with wife Esther A. (Young) Bentley, identified in more contemporary handwriting; taken by the Conkey & Hibbard studio of Glens Falls, New York. The reverse has additional handwriting, presumably from the era when the photograph was taken: "Bentley, Meadow Grove, Nebraska". This may have indicated that the photograph was to be sent to George's and Esther's relatives there or that George and Esther were visiting at Glens Falls from Nebraska when the photograph was made. Luella Sophronia Bentley; cabinet photograph by the J. F. Holley studio of Chestertown, New York. She was the daughter of George M. Bentley and Esther Ann (Young) Bentley. Luella Sophronia Bentley, born December 29, 1860 at Queensbury, New York, daughter of George M. Bentley and Esther Ann (Young) Bentley. No studio imprint. Mabel V. Bentley, age 19-1/2 months [would marry Harvey Guiles]; with brother Harry G. Bentley, age 3 years 3-1/2 months. Children of Clarence Bentley and Minnie (Vaughn) Bentley. The photograph was taken on March 24, 1896 at the Ingalls studio at 145 Glen Street, Glens Falls, New York. Martha Esther Bentley, "Meb", with parents Alton Edward Bentley and Evvie Eliza (Rouse) Bentley; 1884 cabinet photograph by the New York Gallery, 25 Third Street, San Francisco, California, D. Sewell & Co.
Martha Esther Bentley, "Meb"'; CDV with no studio imprint. Minnie (Vaughn) Bentley, wife of Clarence Bentley. 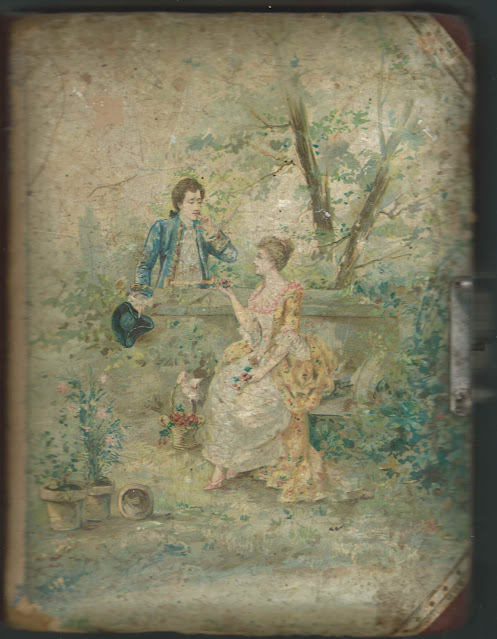 According to handwriting on the reverse, the photograph was intended for A. E. Bentley and family and was dated June 1897. A. E. was Alton Edward Bentley, brother of Minnie's husband Clarence Bentley, whom Minnie married in 1892. The photograph was taken by the Ingalls studio of Glens Falls, New York. Henry Haskins of Boscobel, Wisconsin, with his wife. He was the father of Sarah (Haskins) Rouse. 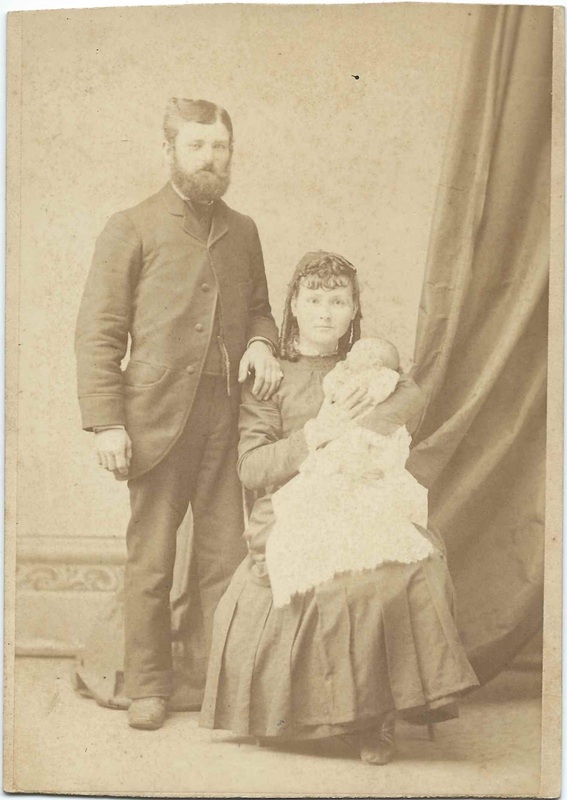 William Henry Haskins was the husband of Mary (Winton) Haskins, but he may have married after Mary's death in 1885, and perhaps this is why the woman is not identified. The cabinet photograph was taken at the Wright studio at Fennimore, Wisconsin. The cabinet photograph was taken at the Wright studio at Fennimore, Wisconsin. Edward B. Rouse [possibly Edwin B. Rouse], with wife Lillie Maria (Williams) Rouse and daughter Minola. The cabinet photograph was taken by the Ira Martin Macy studio of 117 South 4th Street, Norfolk, Nebraska. Edward/Edwin was the son of George Byron Rouse and first wife Sarah Elizabeth (Haskins) Rice. Fred Rouse, son of George Byron Rouse and second wife Martha P. (Crooks) Rouse, "Mattie". No studio imprint. He was Frederick Luther Rouse, born about 1872 in Nebraska. The stylized cut edge of the cabinet photograph matches one done by the Wright studio of Fennimore, Wisconsin, but could be a coincidence. Gertie Rouse; CDV by the Macy & Doughty studio of Norfolk, Nebraska; Presumably Gertrude Ellen Beatrice Rouse, born May 31, 1879 in Nebraska, the daughter of George Byron Rouse and his second wife Mattie P. (Crooks) Rouse. She would marry Burton Russel Hayden. Gertrude Ellen Beatrice Rouse, born about May 1879 in Nebraska, daughter of George Byron Rouse and second wife Martha P. (Crooks) Rouse, "Mattie. The cabinet photograph was taken at the Macy studio of Norfolk, Nebraska. James Byron Rouse, age 9 months; 1899 cabinet photograph taken at the studio of John G. Showell at Fort Benton, Montana. James was born August 21, 1899, son of George W. Rouse and Alberta (Rowe) Rouse. George was the son of George Byron Rouse and first wife Sarah Elizabeth (Haskins) Rouse. Lillie Maria (Williams) Rouse, with husband Edward B. Rouse [or Edwin B. Rouse] and daughter Minola. The photograph was taken at the Ira Martin Macy studio of 117 South 4th Street, Norfolk, Nebraska. Martha P. (Crooks) Rouse, "Mattie", second wife of George Byron Rouse. The cabinet photograph was intended for Alton Edward Bentley of Meadow Grove, Nebraska, whose name and address is written on the reverse. No studio imprint. Minola Rouse, with parents Edward B. Rouse [or Edwin B. Rouse] and Lillie Maria (Williams) Rouse. The photograph was taken at the Ira Martin Macy studio of 117 South 4th Street, Norfolk, Nebraska. Effie Wells Russell, in a photograph with Erie G. Wells; Nellie Crooks Wells; Jessie Wells; Emma Wells; Ruthie Russell. The photograph was taken by the Olson studio of Newman Grove, Nebraska. Ruthie Russell, in a photograph with Erie G. Wells; Nellie Crooks Wells; Effie Wells Russell; Jessie Wells; Emma Wells. The photograph was taken by the Olson studio of Newman Grove, Nebraska. Emma Wells, in a photograph with Erie G. Wells; Nellie Crooks Wells; Effie Wells; Jessie Wells; Ruthie Ruthie Russell. The photograph was taken by the Olson studio of Newman Grove, Nebraska. Erie G. Wells, in a cabinet photograph with Nellie Crooks Wells; Effie Wells Russell; Jessie Wells; Emma Wells; Ruthie Russell. The photograph was taken by the Olson studio of Newman Grove, Nebraska. Jessie Wells, in a photograph with Erie G. Wells, Nellie Crooks Wells; Effie Wells Russell; Emma Wells; Ruthie Russell. The photograph was taken by the Olson studio of Newman Grove, Nebraska. Nellie Crooks Wells, in a cabinet photograph with Erie G. Wells; Effie Wells Russell; Jessie Wells; Emma Wells; Ruthie Russell. The photograph was taken by the Olson studio of Newman Grove, Nebraska.